Join Hadassah for an interesting and meaningful webinar event, where attendees will have the opportunity to ask questions. 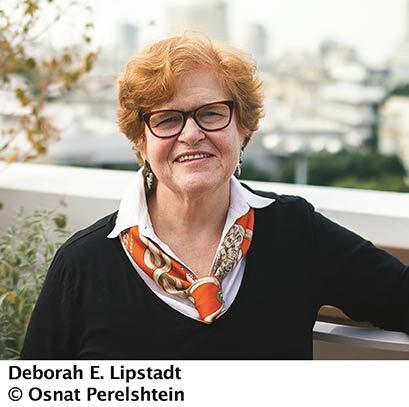 Acclaimed historian Deborah Lipstadt will discuss her recently released work, Antisemitism: Here and Now, in which she provides superbly reasoned, brilliantly argued, and certain to be controversial responses to troubling questions about anti-Semitism. Admission is limited to one ticket per registrant. Please make sure that you refer to the confirmation email for the video link and audio details. Suggested Minimum Contribution : $18.00. These funds will support Hadassah's ongoing efforts to combat anti-Semitism. 1. Question - Not Required - Please write your question for Prof. Lipstadt here. Limit, one question per person. Lipstadt's book, Antisemitism: Here and Now, can be purchased here. Deborah Lipstadt is an American historian, best known for authoring the books Denying the Holocaust, History on Trial: My Day in Court with a Holocaust Denier and The Eichmann Trial. She is the Dorot Professor of Modern Jewish History and Holocaust Studies at Emory University. Lipstadt served as a consultant to the United States Holocaust Memorial Museum. The Forward listed her as number two of the top fifty Jewish influentials in America.